Due to the key role of posttranslational modifications (PTMs) such as lysine acetylation in numerous signaling and regulatory pathways, the ability to identify novel PTMs and to quantify their abundances provides invaluable information for understanding these signaling networks. Currently, mass spectrometry (MS) arguably serves as the most high-throughput and unbiased platform for studying PTMs. 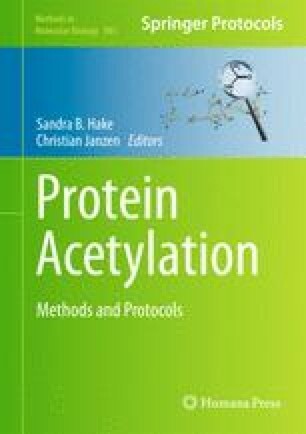 Here we detail experimental and analytical procedures for the characterization of lysine acetylation on proteins in general and on histones in particular, which are among the most highly modified proteins in eukaryotic cells. BMZ is supported by the NSF Graduate Research Fellowship Program and BAG gratefully acknowledges support from a National Science Foundation (NSF) Early Faculty CAREER award, an NIH Innovator award (DP2OD007447) from the Office of the Director, NIH, and an American Society for Mass Spectrometry research award sponsored by the Waters Corporation. We also thank all members of the Garcia lab for helpful discussion during the composition of this chapter.